NEWPORT, R.I. (AP) — Seven people police say are connected to an international yacht race have been arrested in Rhode Island following a confrontation with officers. 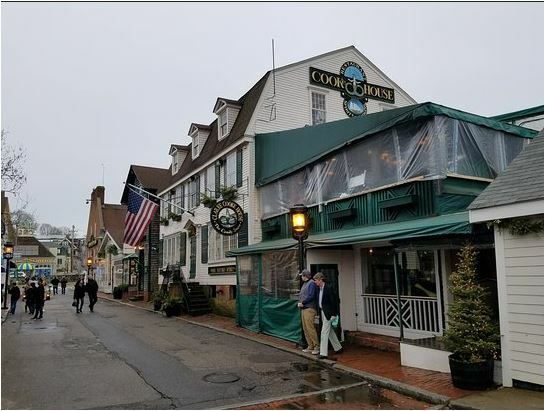 The Newport Daily News reports that police responded to a fire alarm at a Newport bar at about 1 a.m. Tuesday and found about 100 people at the scene, several of whom refused orders to leave the building. Police say Andrew Cape, of Lymington, England, and Stefan Coppers, of Amsterdam, Netherlands, were involved in a physical confrontation with two officers and were charged with assaulting a police officer. Five others, from the United Kingdom, Poland, Spain and Australia, were charged with disorderly conduct. Police say all are connected to the Volvo Ocean Race. Charges against all seven were dismissed in court later Tuesday. A lawyer for all seven refused comment. Full watch of Newport police ultimately respond to scene after initial fire alarm call escalates. NEWPORT — Seven people apparently connected to the Volvo Ocean Race were arrested early Tuesday morning after an incident outside the Clarke Cooke House. Police said they were called to the restaurant and bar on Banister’s Wharf for a fire alarm sounding just after 1 a.m. They found about 100 people at the scene. According to police, several people refused orders to get out of the building and move away from fire trucks so firefighters could go inside to reset the alarm. Then, police said, Andrew J. Cape, 55, of Lymington, England, pushed Patrol Officer Bradford Coyle in the chest and swore at him, saying he wasn’t going anywhere. Police said Coyle tripped while trying to get control of Cape’s arm and fell on top of him onto a curb. According to police, Stefan Coppers, 36, of Amsterdam, Netherlands, then jumped on the officer’s back. When Patrol Officer Brittany Foster stepped in to help Coyle, Coppers turned and came at her in a threatening manner, police said. Cape was arrested on charges of assaulting a police officer and disorderly conduct. Coppers was arrested on charges of assaulting a police officer, obstructing police, resisting arrest and disorderly conduct. Both appeared later in the day in District Court before Judge Colleen Hastings and pleaded no contest to the disorderly conduct charges. The charges were filed, meaning they could be removed from court records in a year provided they face no new charges. The charge against Cape of assaulting a police officer was dismissed. The charges against Coppers of assaulting a police officer, obstructing police and resisting arrest were dismissed. Cape was ordered to make a $200 contribution and Coppers a $400 contribution to the Boys & Girls Clubs of Newport County. The Volvo Ocean Race website lists Andrew Cape, 55, as the navigator for Team Brunel. Police said the full watch of Newport police — nine officers — was called to get control of the situation. Middletown and Naval Station Newport police provided mutual-aid assistance to cover any other calls. Simon M. Botes, 33, of Palma De Mallorca, Spain, on a disorderly conduct charge. He was taken to Newport Hospital and later treated and released. Botes pleaded no contest to the charge, which was filed. Isabel Hall, 30, of London on a disorderly conduct charge. Hall pleaded no contest to the charge, which was filed. She was ordered to make a $100 contribution to the Boys & Girls Clubs. Timothy F. Newton, 55, of Apthorpe, England, on charges of disorderly conduct, resisting arrest and assaulting Patrol Officer Matthew Sardinha. He pleaded no contest to the disorderly conduct charge, which was filed. He was ordered to make a $300 contribution to the Boys & Girls Clubs. The charges against Newton of resisting arrest and assaulting a police officer were dismissed. Martin Ostrowski, 33, of Olsztyn, Poland, on charges of disorderly conduct and resisting arrest. Police said Ostrowski was taken to Newport Hospital and later treated and released. He pleaded no contest to the disorderly conduct charge, which was filed. He was ordered to make a $200 contribution to the Boys & Girls Clubs. The resisting arrest charge against Ostrowski was dismissed. Deirdre Waters, 31, of Queensland, Australia, on a disorderly conduct charge. She pleaded no contest to the charge, which was filed. She was ordered to make a $100 contribution to the Boys & Girls Clubs. Attorney Craig Hein of Newport, the attorney for all seven who were arrested, told The Daily News on Tuesday he had no comment. Newport police Lt. Frank Rosa said it was his understanding all the people involved in the incident were connected to the international sailing race, which is in town until May 20. He also said no police officers were injured in connection with the incident. Otherwise, Rosa referred questions to Sail Newport, the host organization for the race stopover here. “At this point, we’re going to refrain from any comment,” Rosa said. A call from The Daily News to a Sail Newport spokeswoman Tuesday afternoon was not immediately returned. At a Volvo Ocean Race event earlier in the day, the incident was the talk of several team members of Vestas 11th Hour Racing. During conversations among people wearing team jackets, several said it seemed police overreacted to the incident and things got out of hand unnecessarily. “We’ve partied around the world and we’ve never had anything like this,” one team member said.